The Honor 6X officially announced in October only for the Chinese market. Some shops can brought to another countries , but from the Huawei was not officially available outside the Chinese market. During CES 2017, it announced the availability of Honor 6X will extend to European countries and the USA. One of the most important features is its dual camera with the 12 Megapixel and 2 Megapixel. The battery is 3340mAh, and could not be missing and the fingerprint sensor. 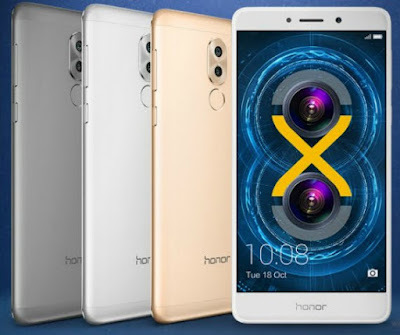 The Honor 6X will be available in silver gold and gray. From today start orders in US and European countries such as M. Britain, France, Germany, Italy, Netherlands, Spain, Czech Republic, India, Russia, Malaysia, Saudi Arabia and the United Arab Emirates. The Honor 6X has a screen 5.5-inch IPS 1080p, octa-core 655 processor and metal structure. Incorporates 3GB of RAM with 32GB capacity and there is a second version with 4GB RAM memory and 64GB capacity. The global version mainly for European markets, will be available from January 10 through Vmall and Amazon with price EUR 249, the version with 4GB / 64GB costs 299 euros. In the US, the price is 249.99 and $ 299.99, respectively.